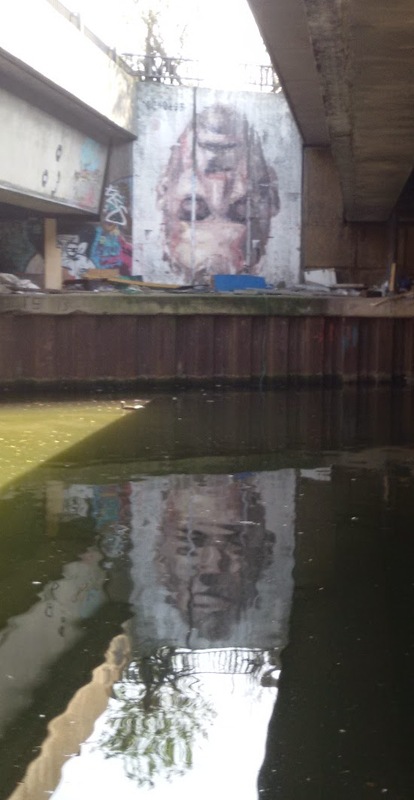 As a general rule I dislike graffiti art but I think this piece is really clever. You can only see the face the right way up when the sun is shining on the water in the right direction. The movement of the water gives the face expression and brings it to life and for me that makes it slightly disturbing. More often than not though you don't see the reflection and all you see is this on the left. I've completed my first drawing. I'm letting this series of drawings take as long as they like to complete which is going to test my patience. I did this one in about 3.5 hours over five sessions. The weather varied over the five days from windy to hot. On the hot day I ate a picnic lunch at the bench where I was working and three people said hello to me as they walked by which I thought was amazing. Two people had the courage to approach me to see what I was doing and have a chat. When I'm concentrating on drawing I become more aware of sounds around me and on the first day I was bombarded with an whirring engine close by, birds tweeting, traffic humming and police sirens off in the distance topped off with a whiff of diesel fumes. When it was windy I had to deal with paper flying around and when it was sunny my eyes watered and my nose ran. These are some of the joys of working outside. 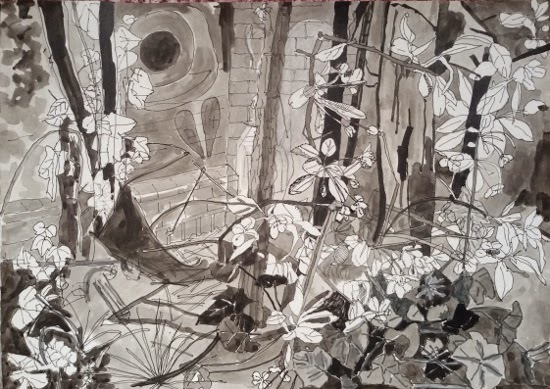 I have been observing the blossom developing over the last few weeks and was keen to concentrate on some of that for my first drawing before it all disappears. I was glad to find that I hadn't left it too late to spend time scrutinising some of it and here are the results. 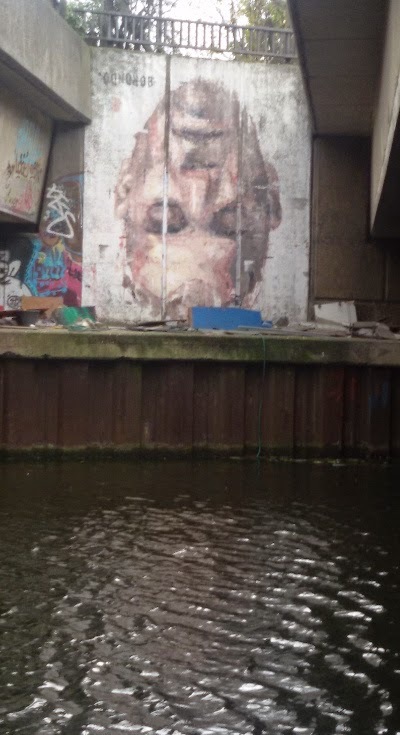 The route of this project is a fraction of the length of my previous project, Drawing my way round London, that travelled round north London beginning at the Woolwich Ferry in the east and ending at Richmond in the west. As the title of this blog reveals this journey is merely 805 of my steps in length. 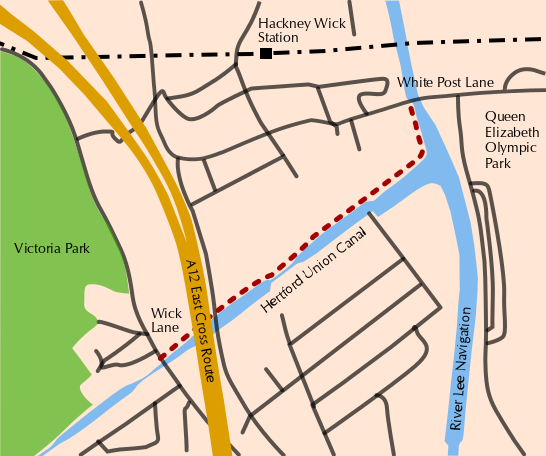 It starts at Wick Lane and covers the towpath of the Hertford Union Canal until it joins the River Lee Navigation at White Post Lane. During this spring season I will be making drawings along the route of anything that takes my fancy and I will stop on 21 June, Midsummer's Day. I will be posting them here for you to see and comment on. 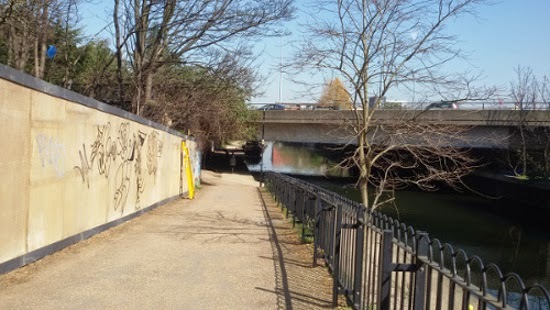 This towpath is regularly used by runners, families taking their children for walks, dog walkers and people out for a stroll. It is close to convivial pubs and Victoria Park, London's first public park. It's where you go when you need to get out of the house and stretch your legs. Other people moor their narrow boats here temporarily and call the place their home. There's generally an air of quiet busyness but during the 19th and 20th centuries this area was a powerhouse of industry which has all but disappeared. So, while I'm posting my new drawings, I'll also be looking at the different heavy industries that worked cheek by jowl with each other close to this very route.